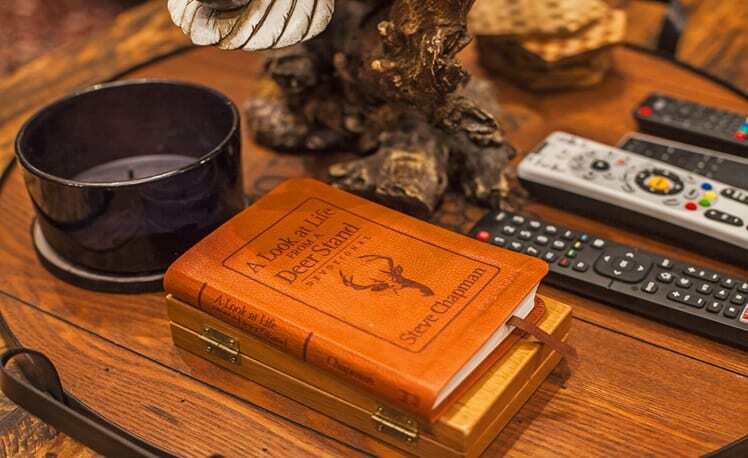 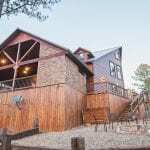 Enjoy a rustic chic design with 4 bedrooms, Outdoor Amenities, Gaming Area and Tree House – Designed to Accommodate and entertain families and groups. 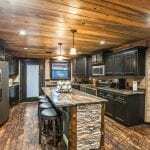 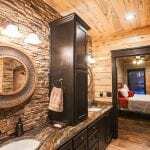 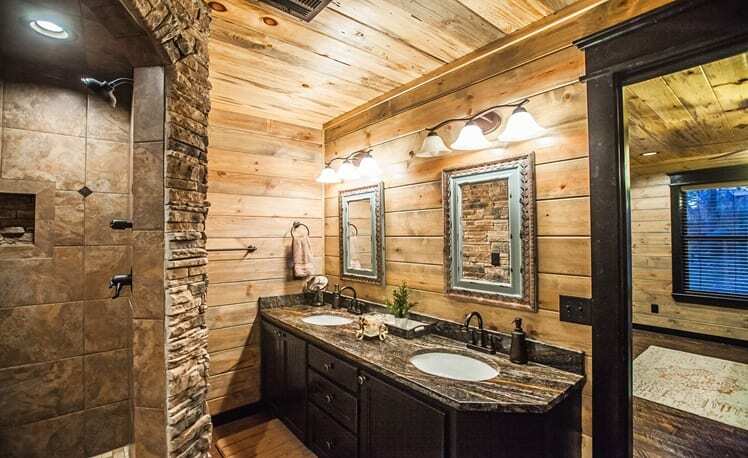 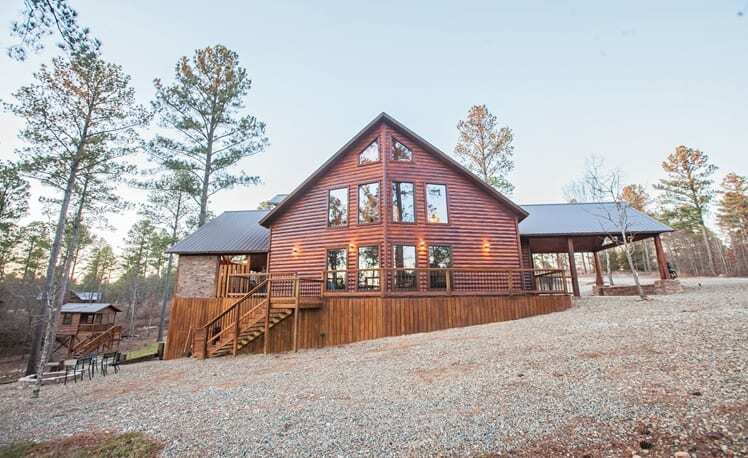 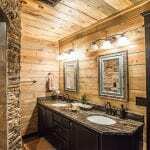 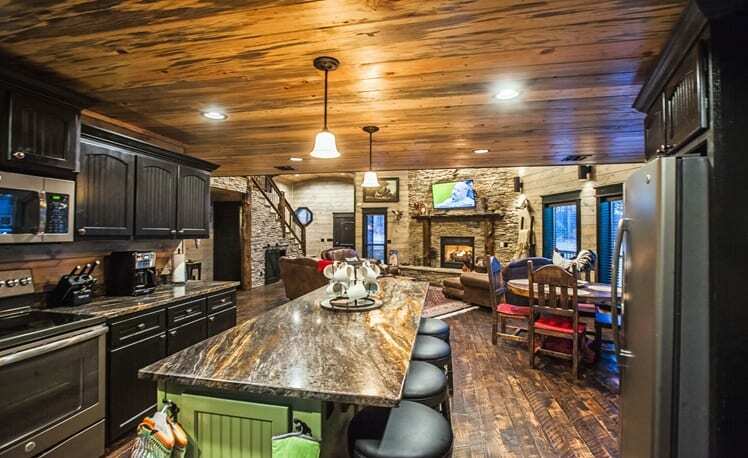 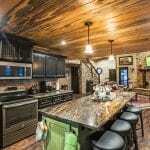 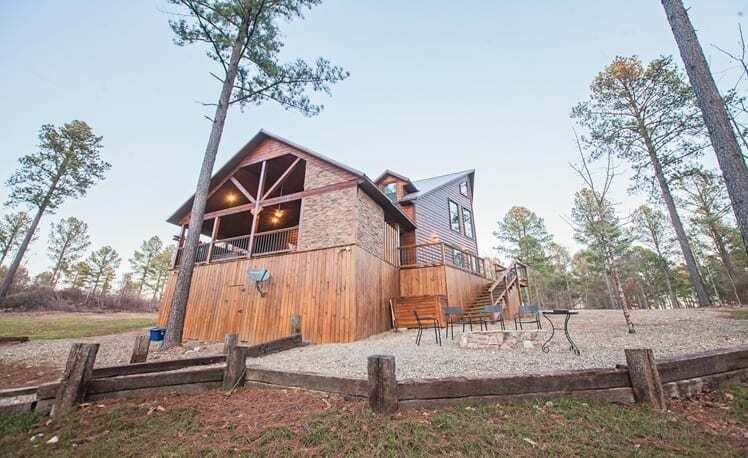 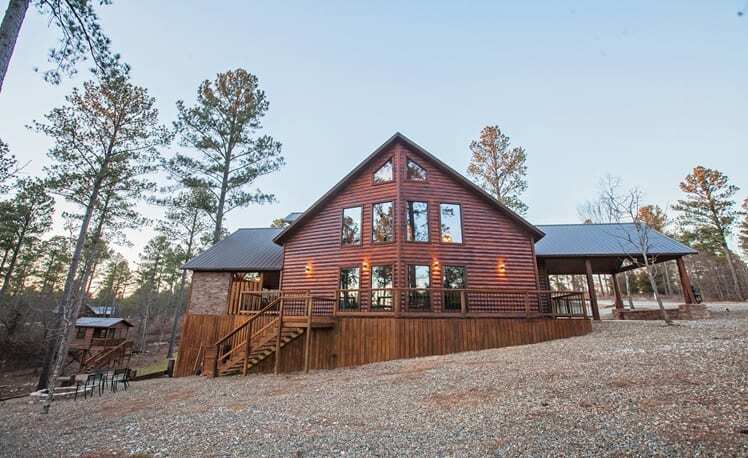 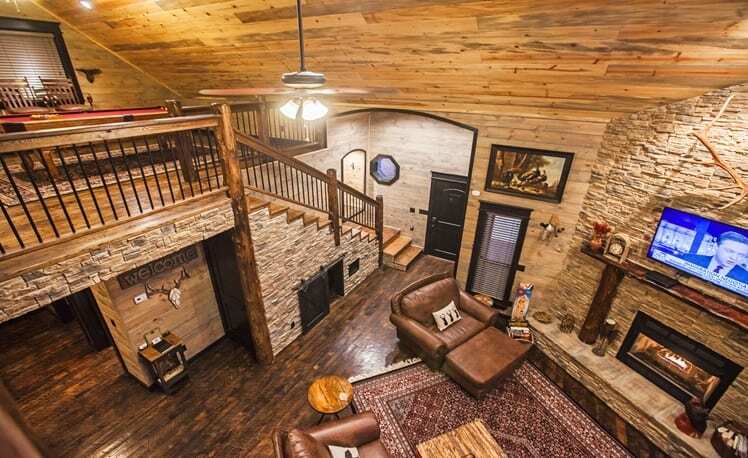 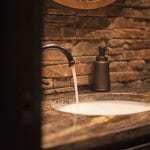 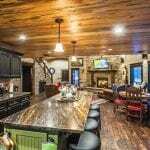 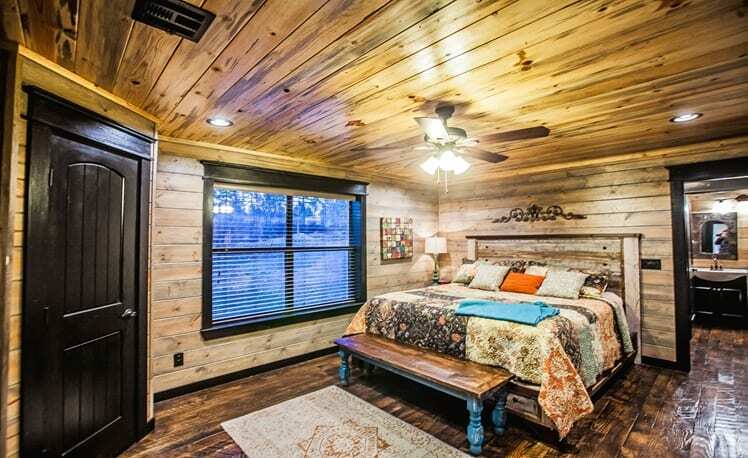 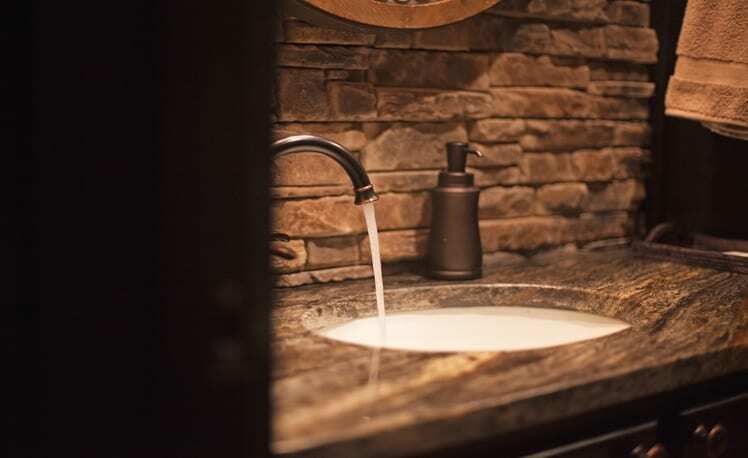 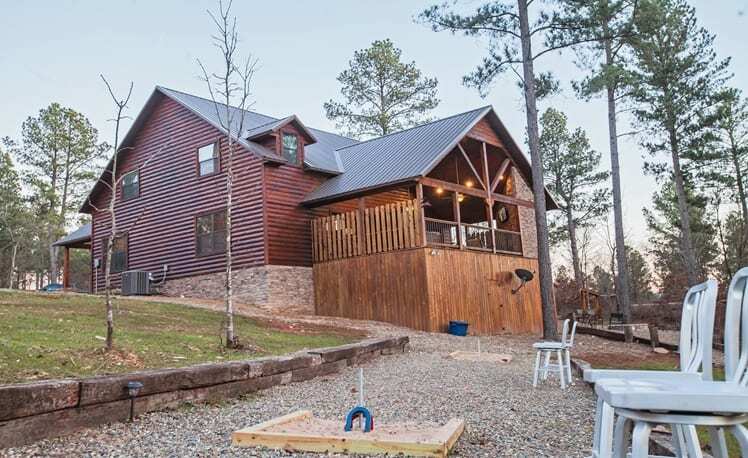 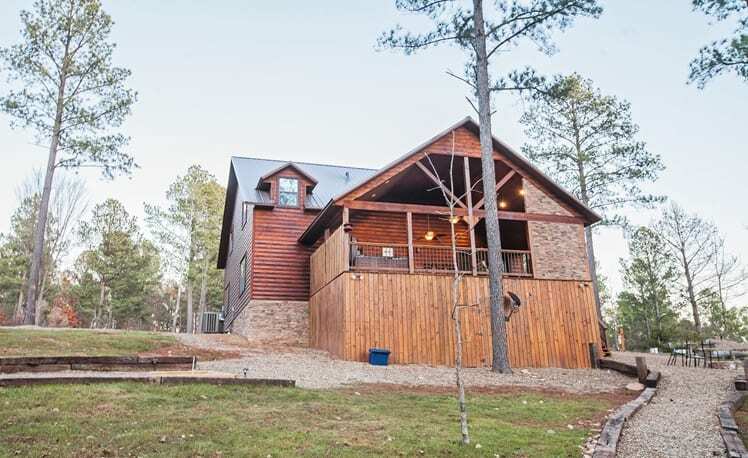 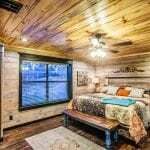 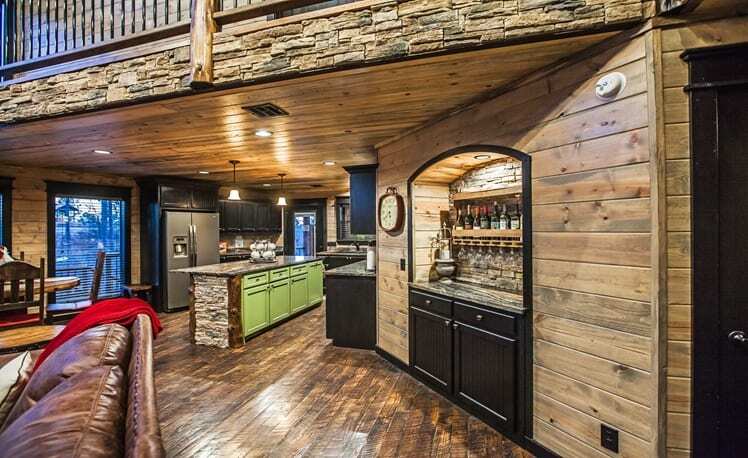 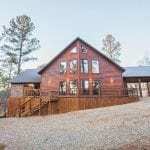 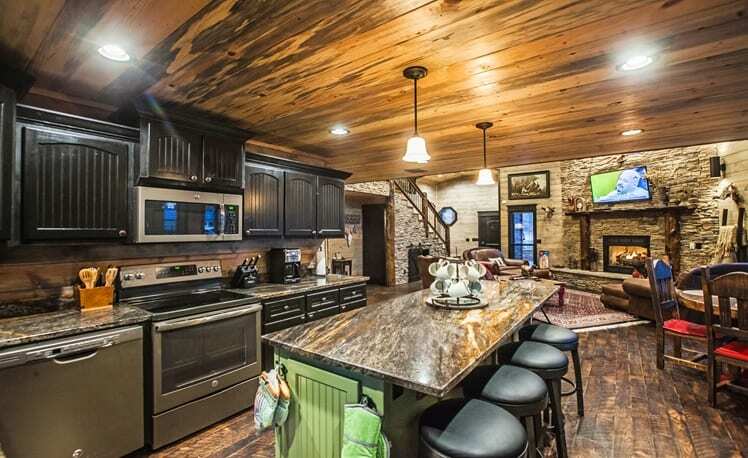 Mountain Melody is elegant and classy, presenting a rustic chic design unique to Beavers Bend. 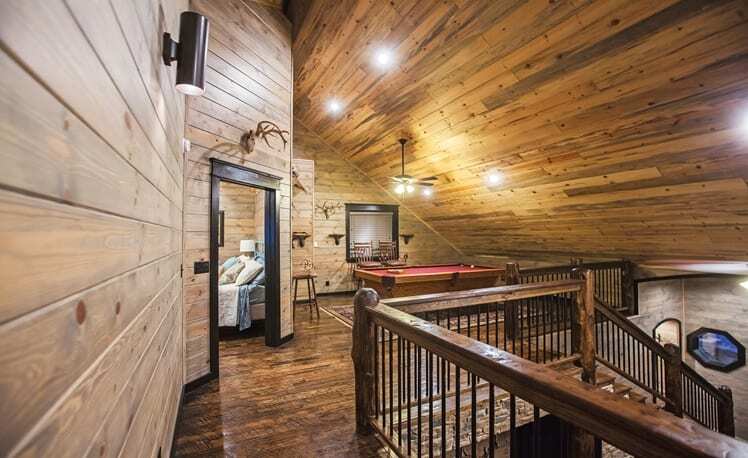 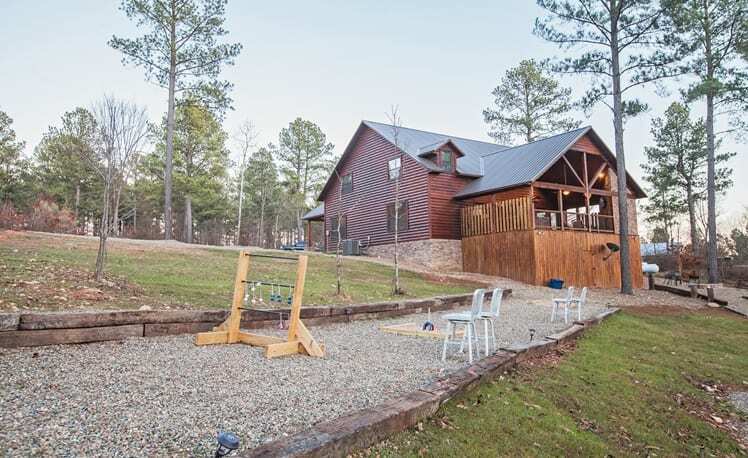 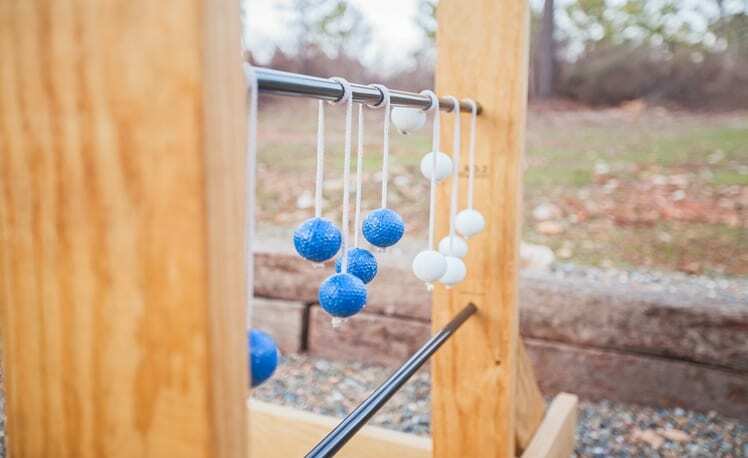 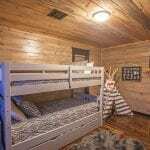 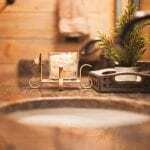 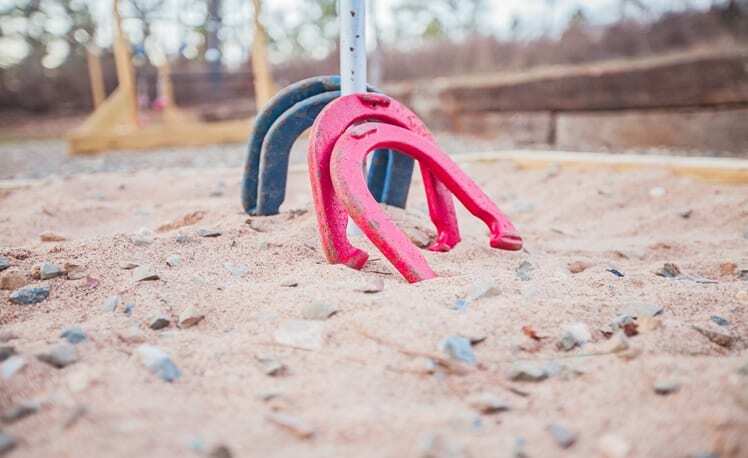 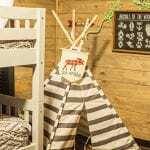 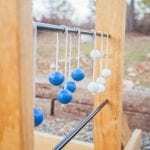 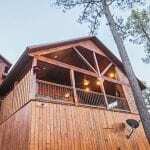 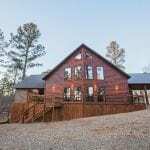 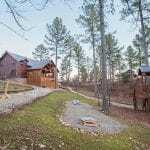 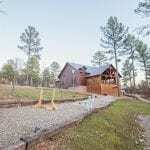 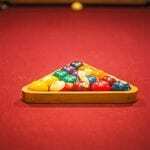 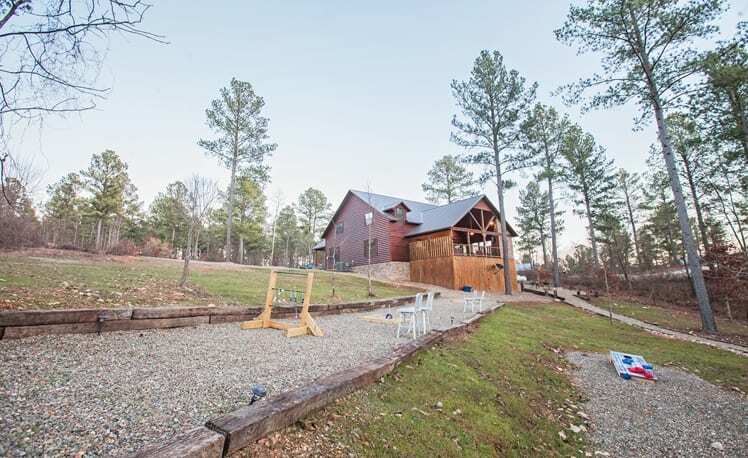 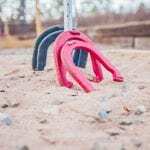 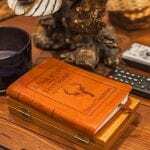 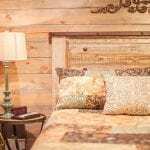 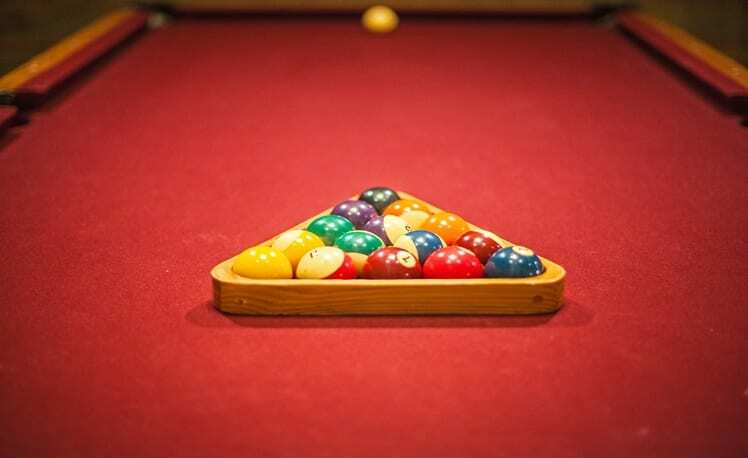 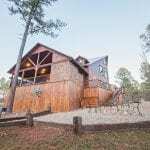 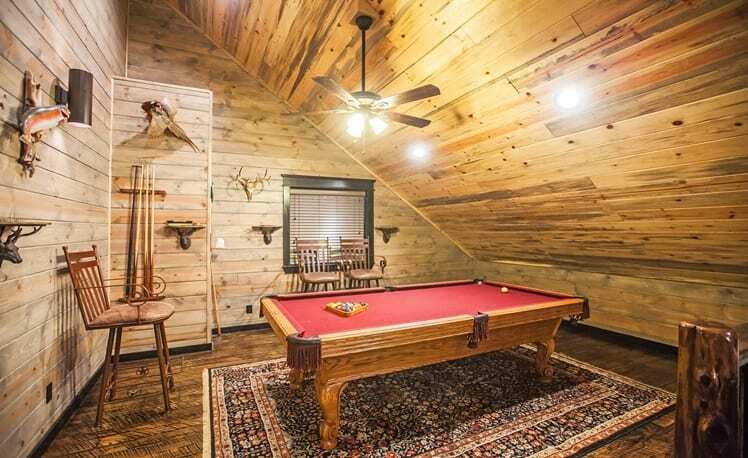 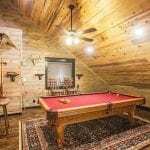 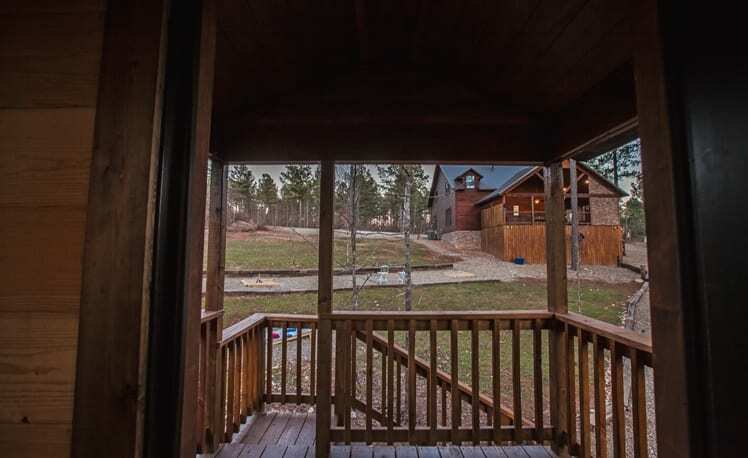 You will find accommodations for up to 11 people including 4 bedrooms, 2.5 spacious baths, bunk room and a Tree House.This lodge is a great gathering spot with several games including ladder golf, horseshoes, and billiards. 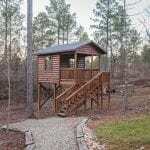 The kids will love the Tree House! 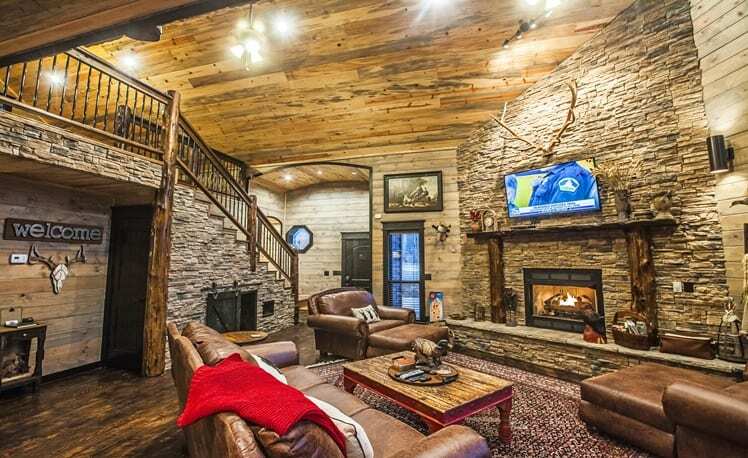 A massive rock fireplace is located in the Great Room. 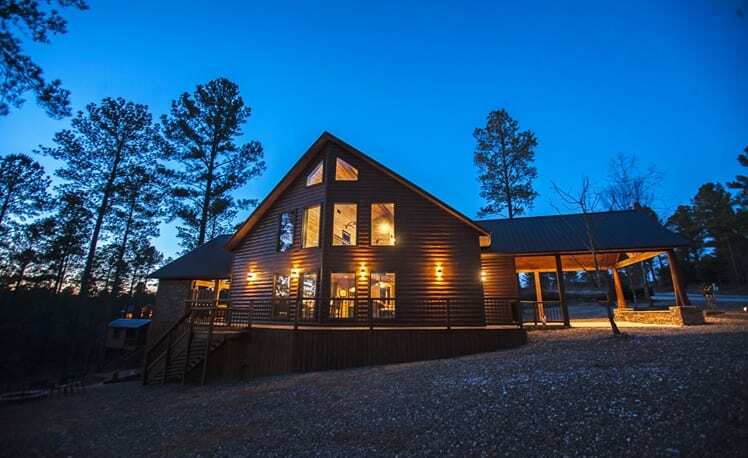 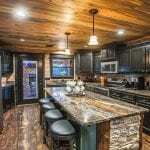 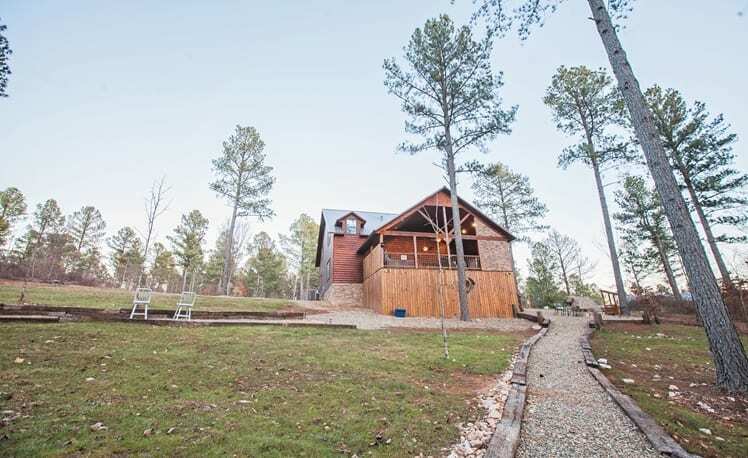 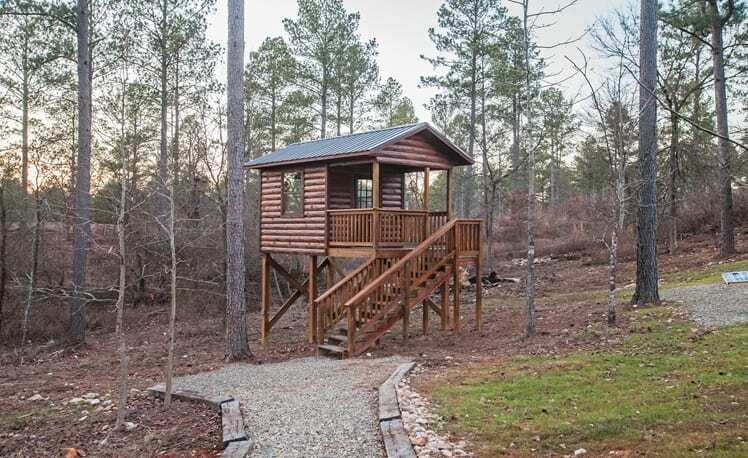 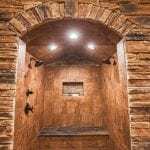 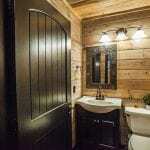 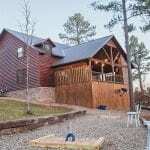 The interior walls are finished in a beautiful blue-gray stain with Pine Log Posts and Cedar Posts. 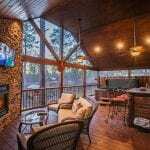 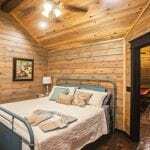 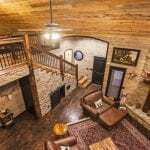 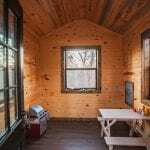 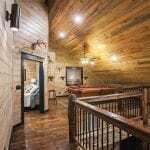 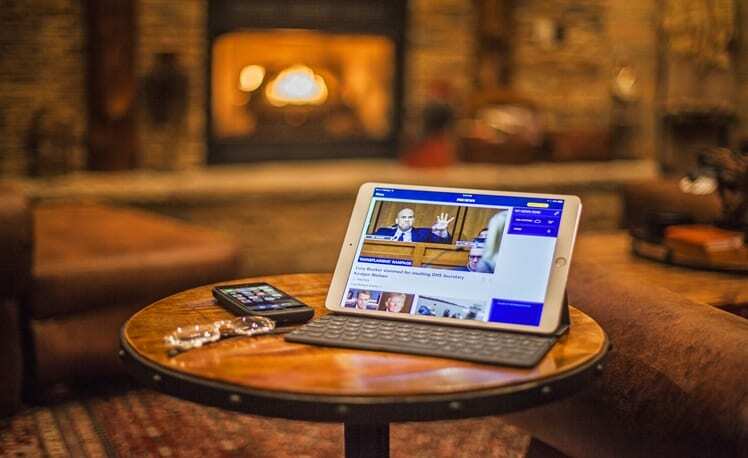 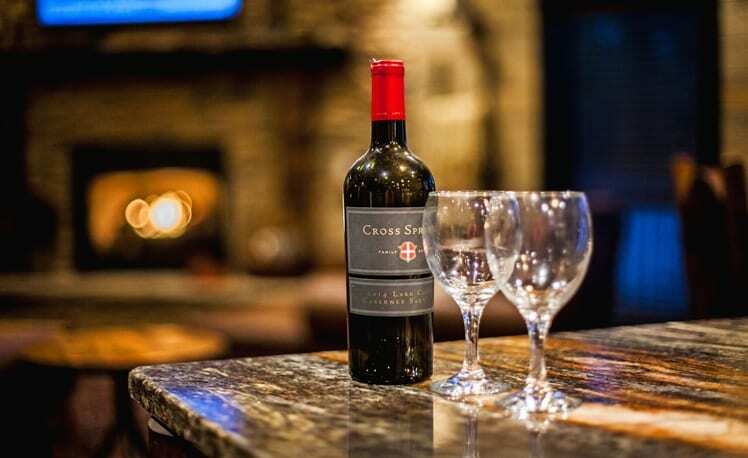 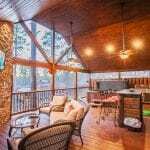 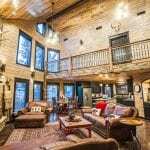 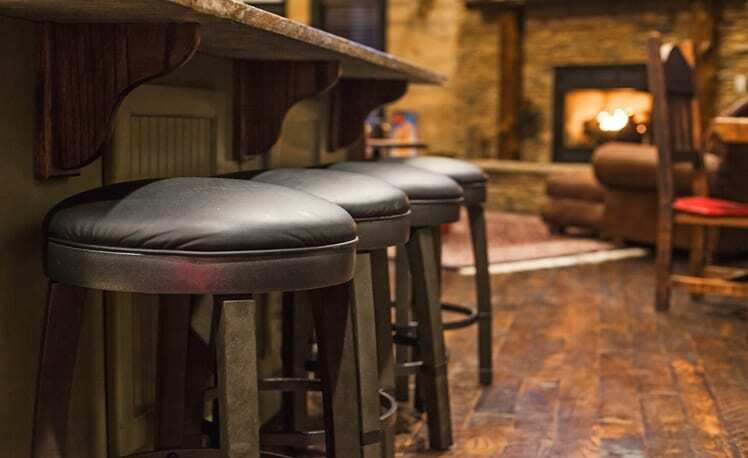 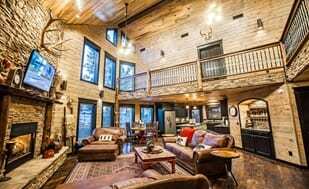 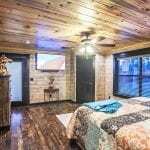 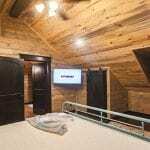 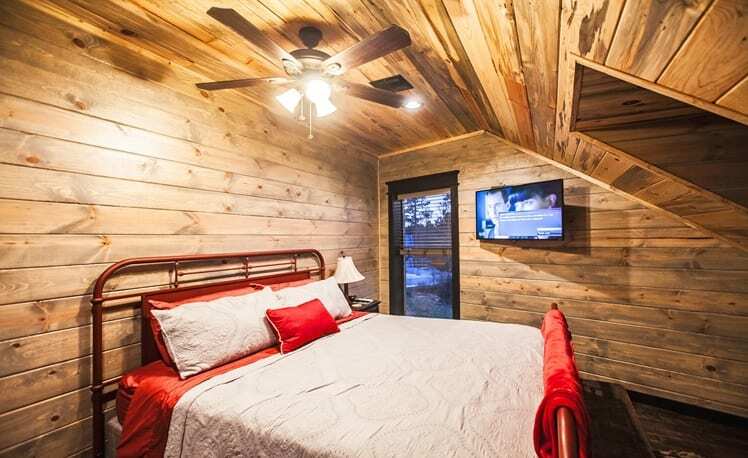 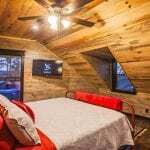 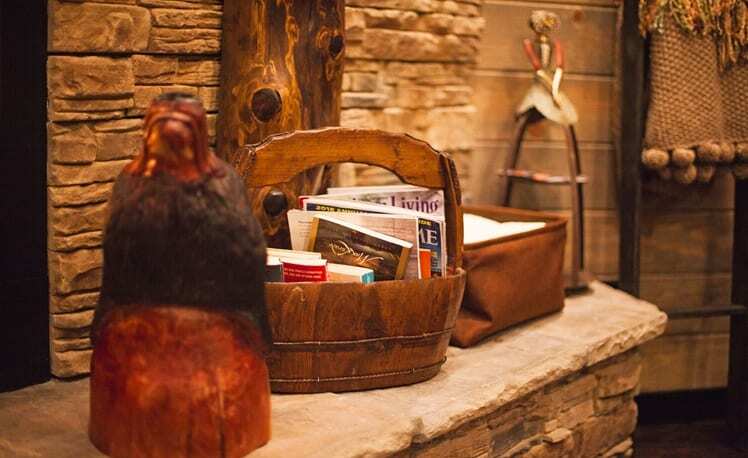 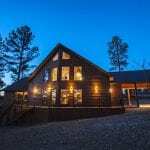 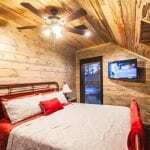 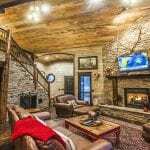 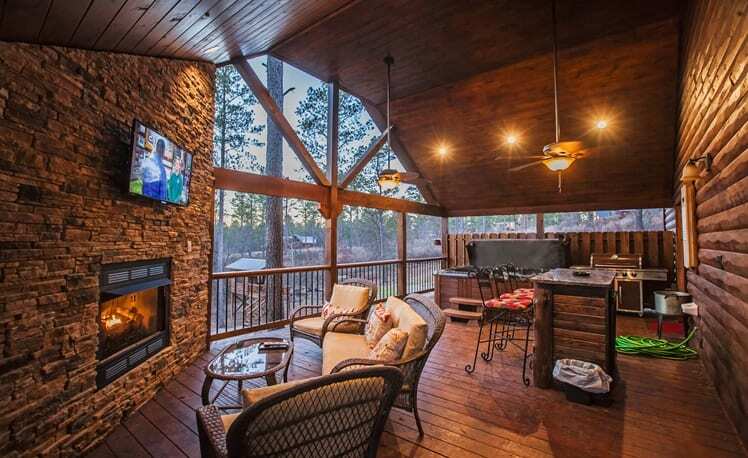 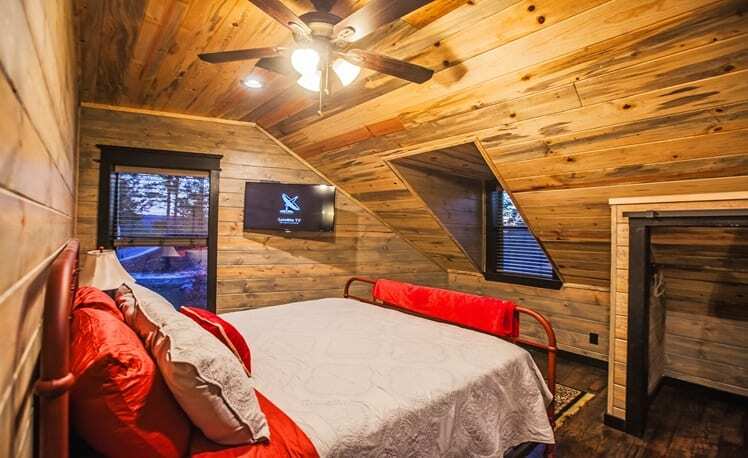 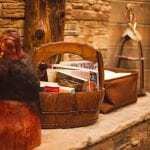 The lodge is equipped with 6 TVs, one in each of the 4 bedrooms, one in the Great Room and another TV under the covered porch directly above the outdoor fireplace for easy viewing! 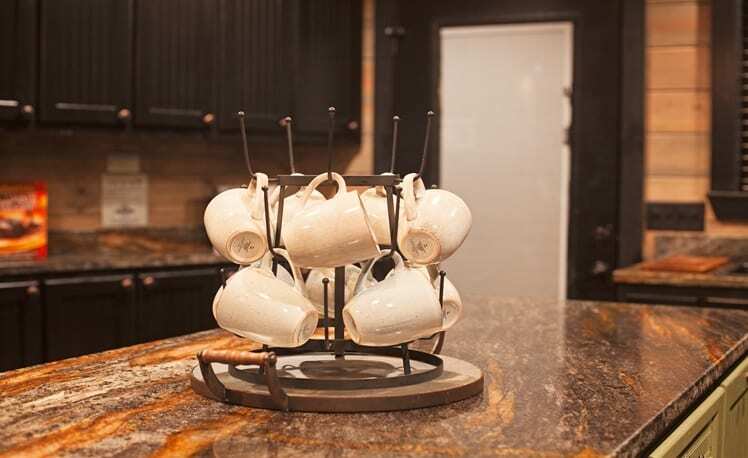 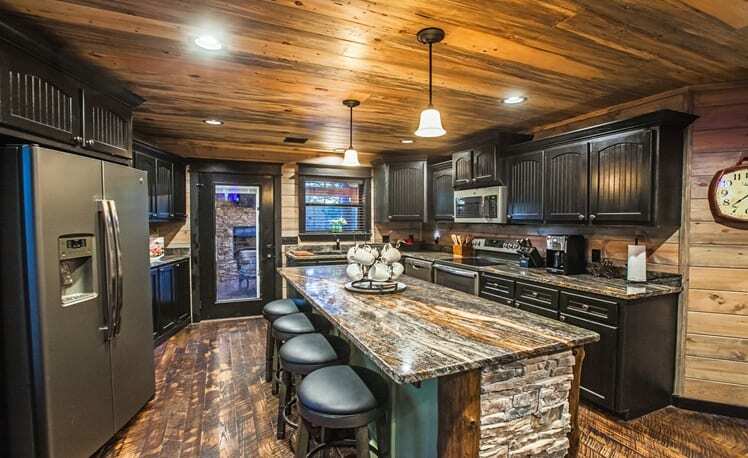 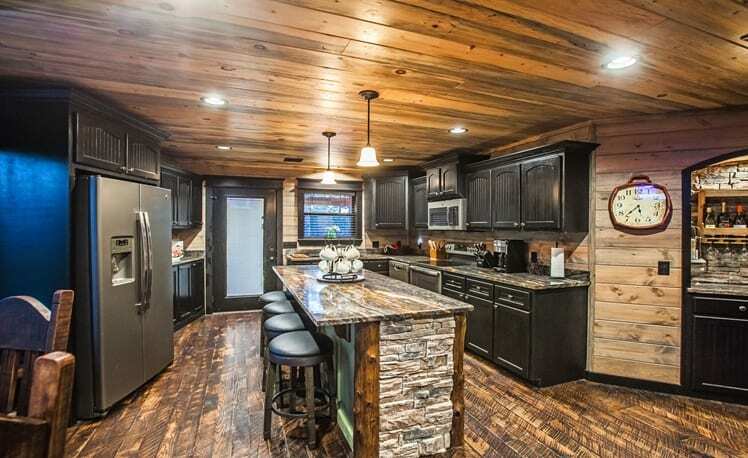 Granite counters are throughout the cabin. 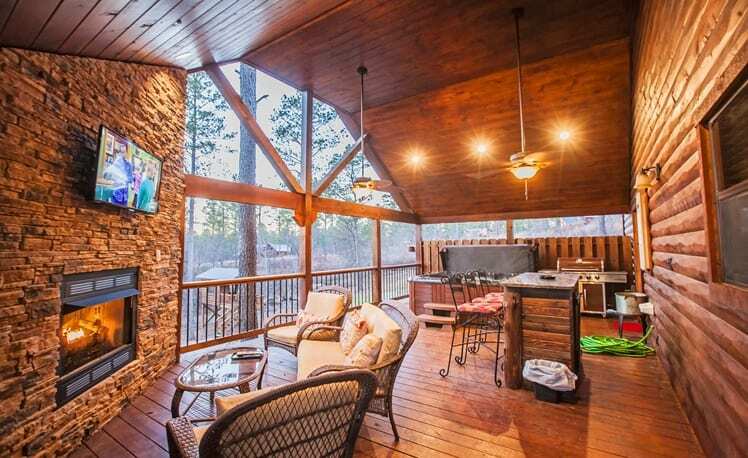 The covered porch has a 6 person Hot Tub, outdoor TV, fireplace, Bar, couch and bistro table. 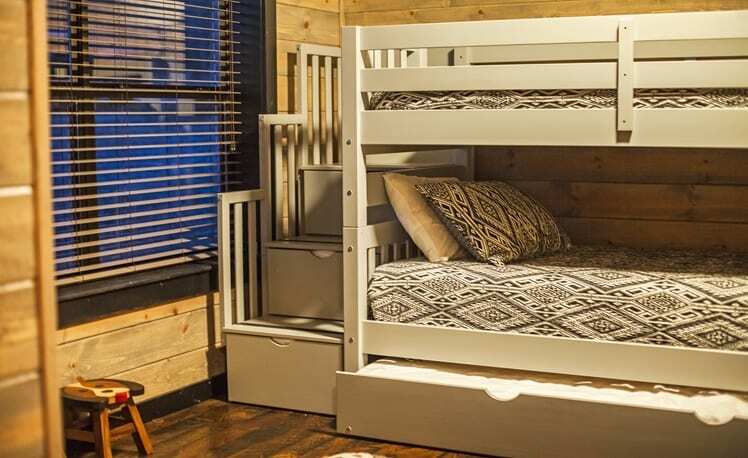 The Mountain Melody is designed for luxury entertaining and fun for kids and adults. 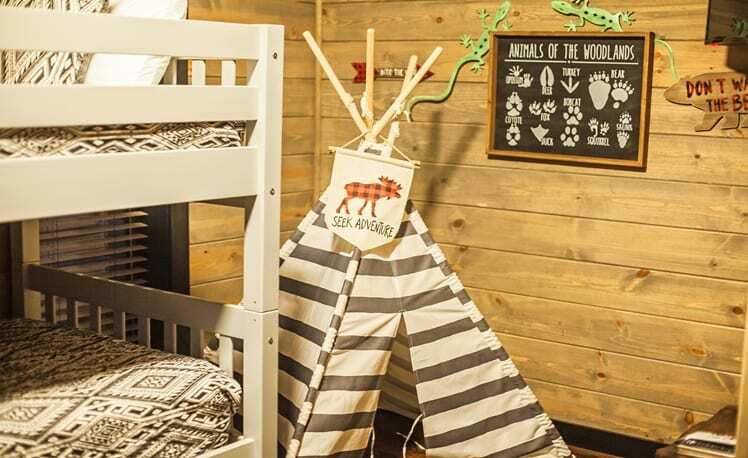 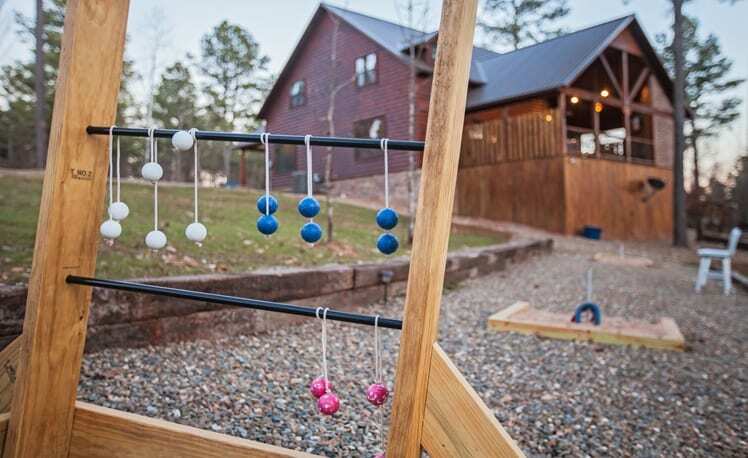 A washer and dryer offer convenient laundry services, and a bunk-room provides a space for the kids to call their own. 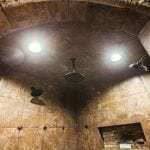 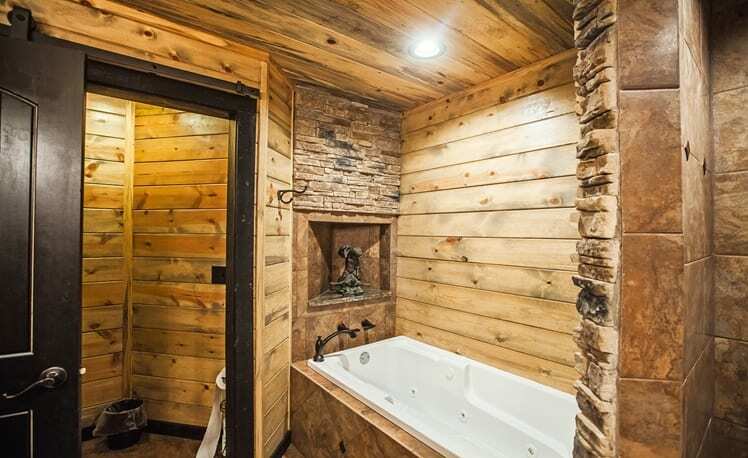 The baths are dual sinks with spacious rock showers. 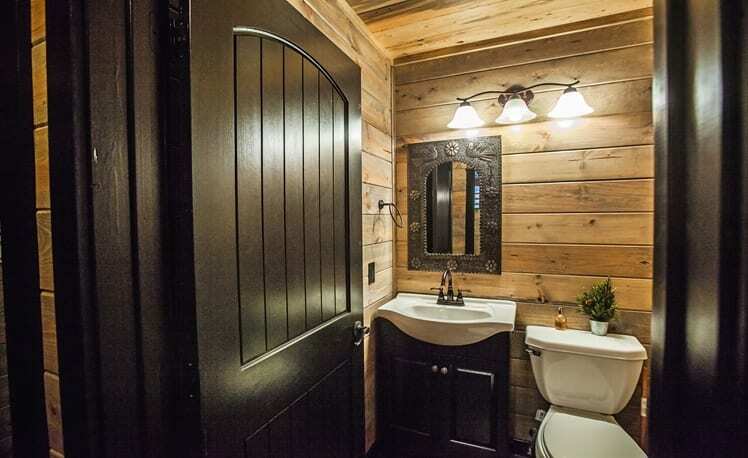 A convenient 1/2 bath is located on the first floor. 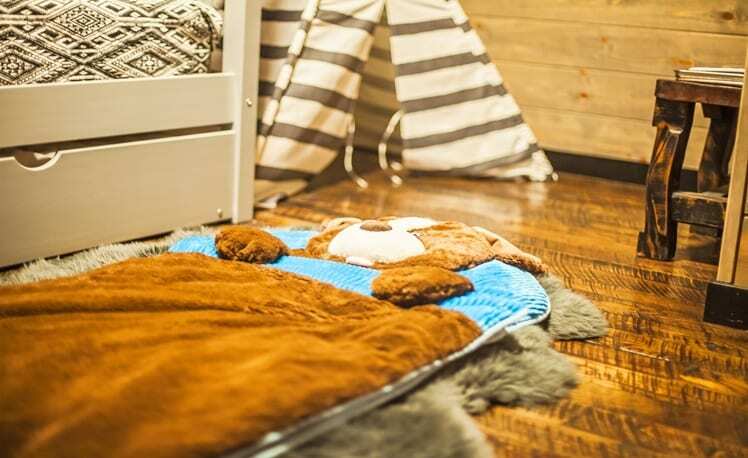 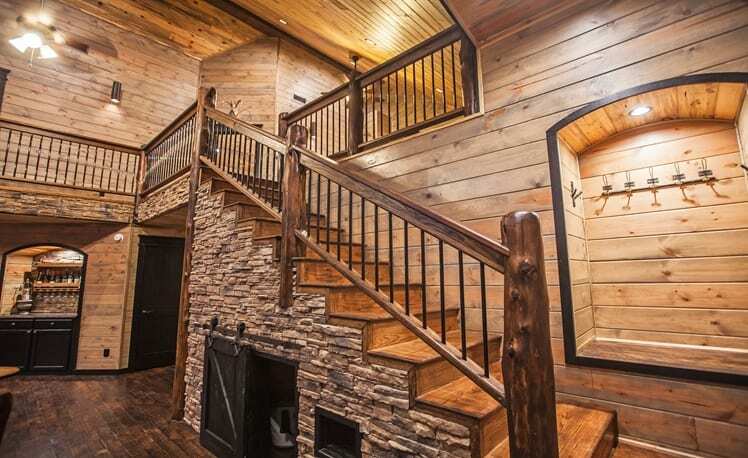 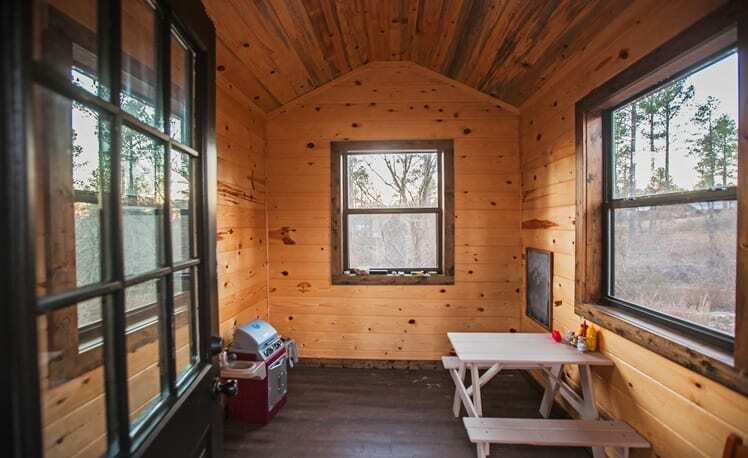 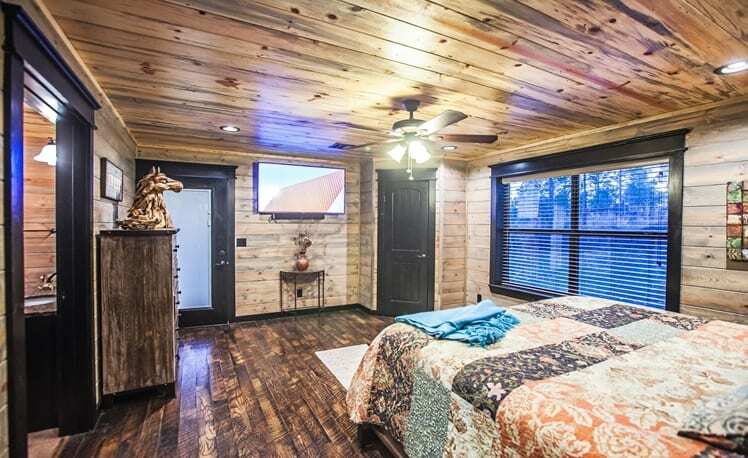 Mountain Melody is pet-friendly with a built-in kennel under the staircase. 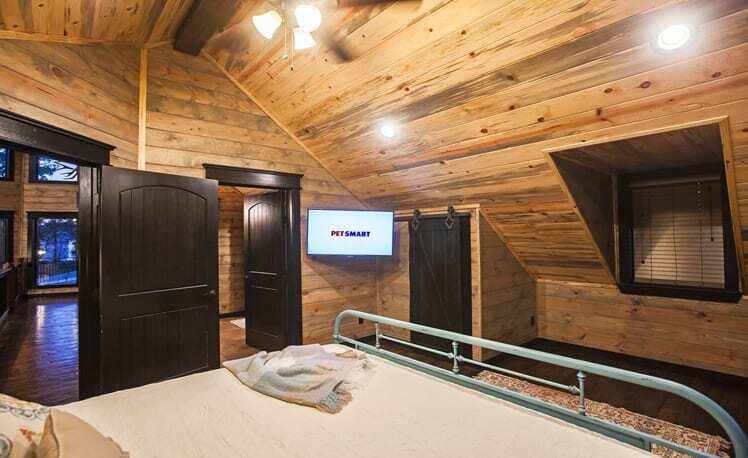 Also, included is WiFi and Direct TV’s Premium Movie Package (including NFL Ticket). 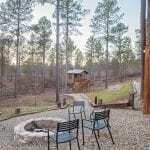 We provide firewood for the fire pit and the gas grill is ready to go with propane. 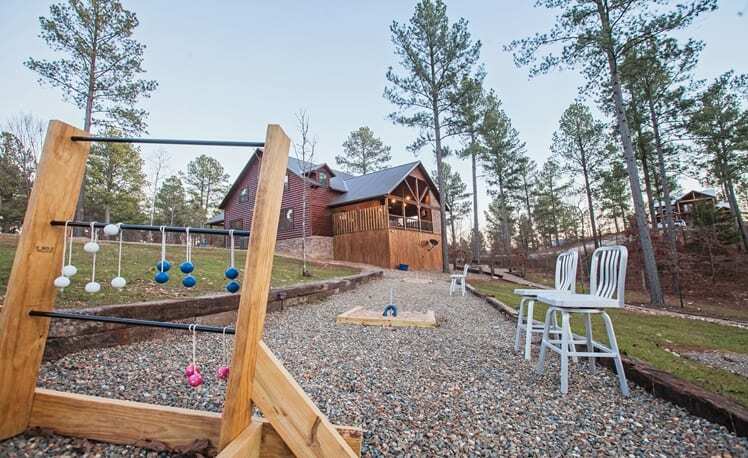 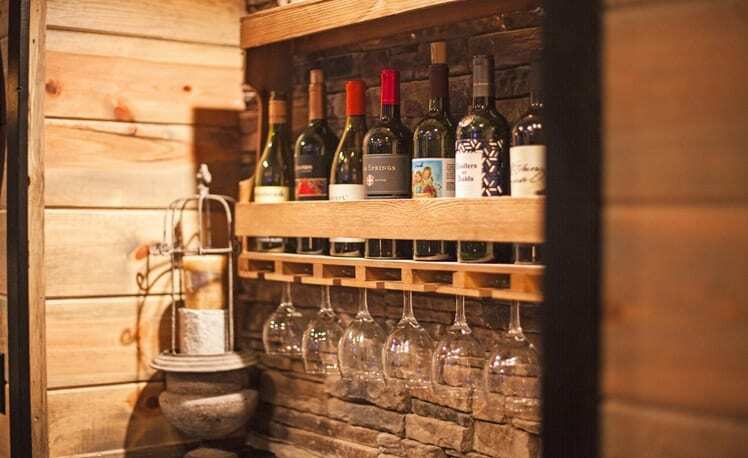 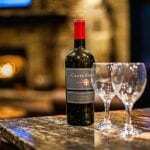 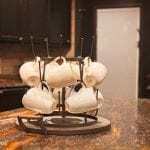 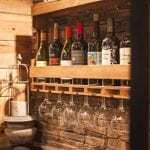 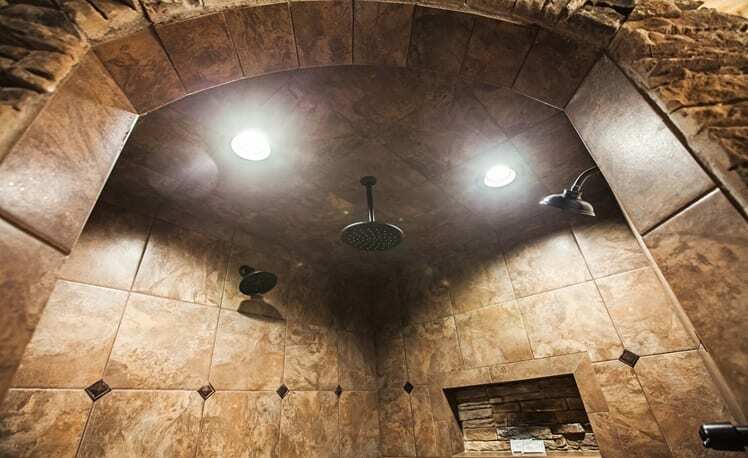 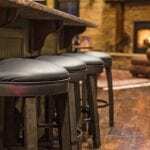 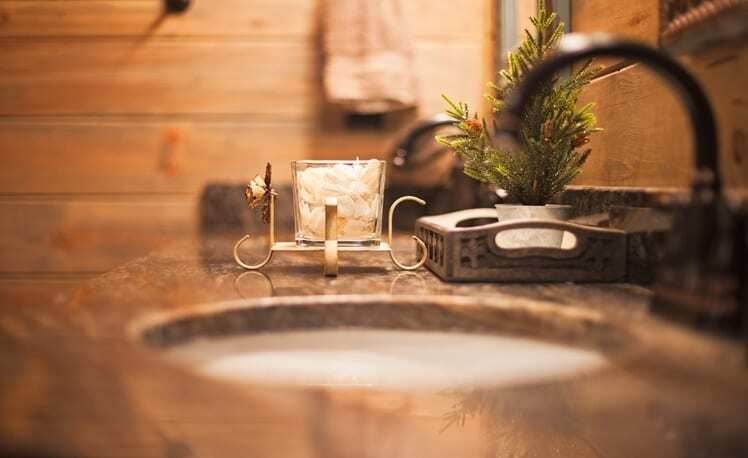 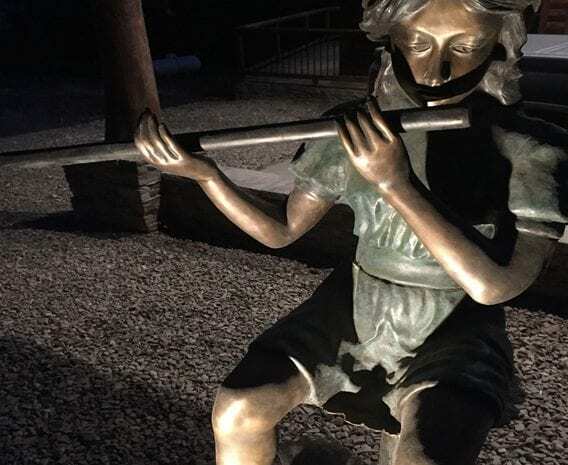 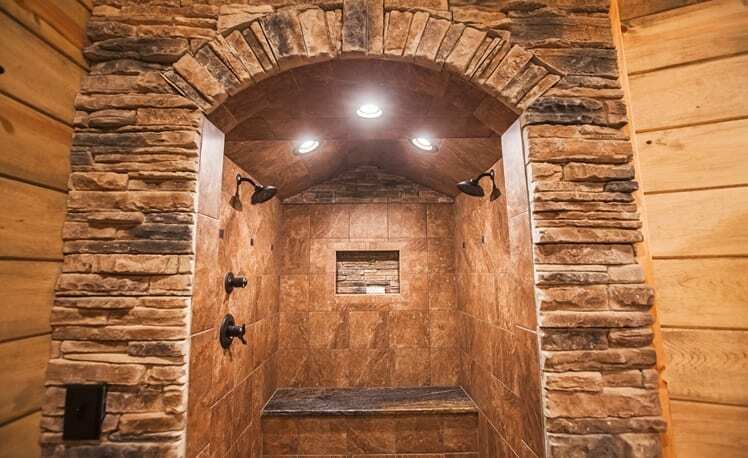 Mountain Melody is located in Timber Creek Trails, close to the Timber Creek Trails Shopping Center, where you will find great dining, a micro brewery with pizza and sandwiches, fun adventure rentals, and specialty shops with ice cream, coffee and pastries. 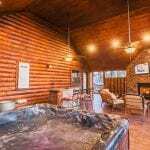 The lake and park areas are a short drive away and Hochatown, with all of its tourist attractions, is also just over 1 mile away. 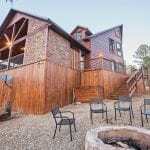 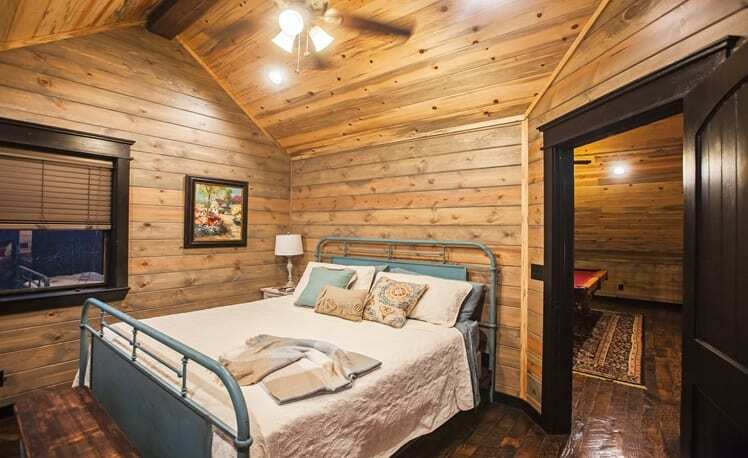 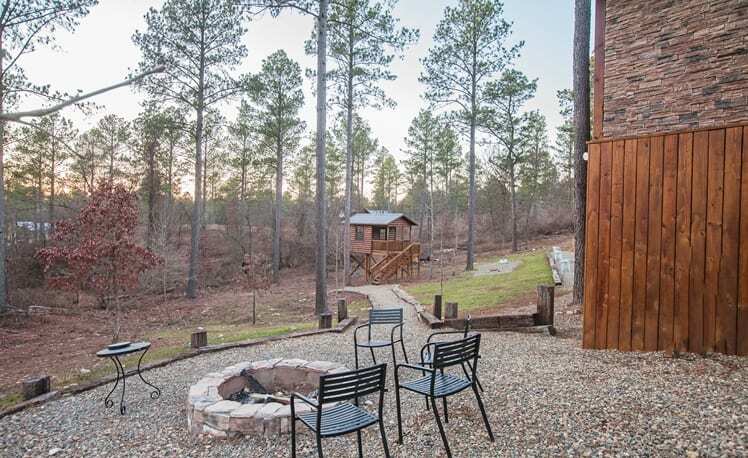 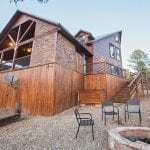 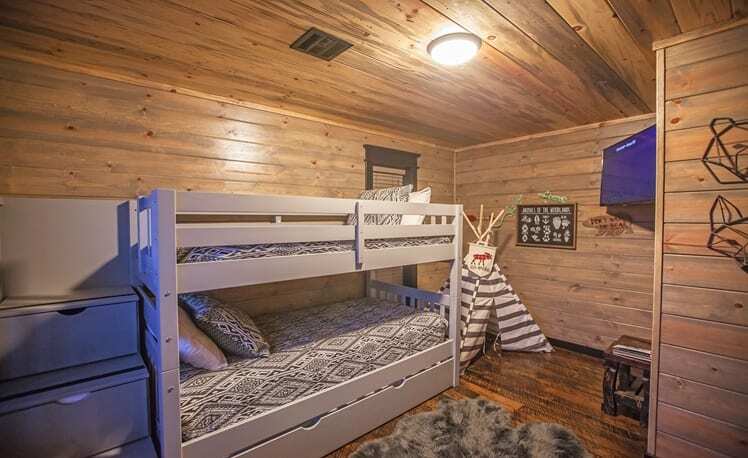 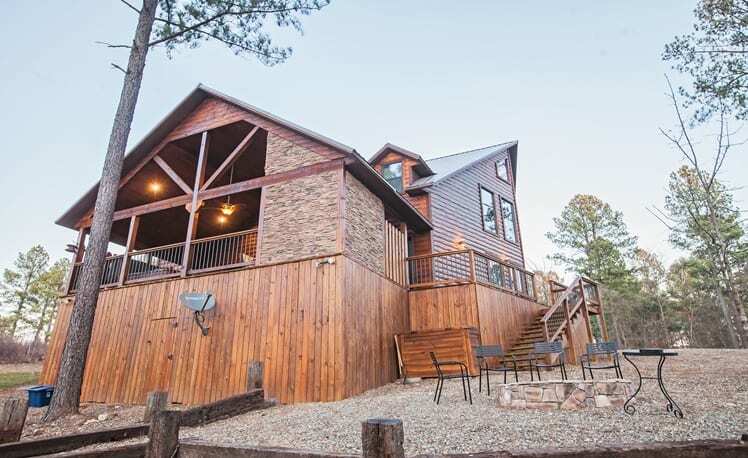 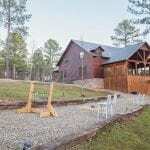 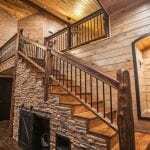 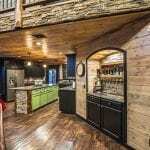 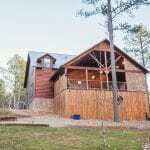 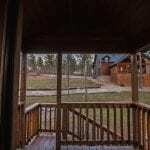 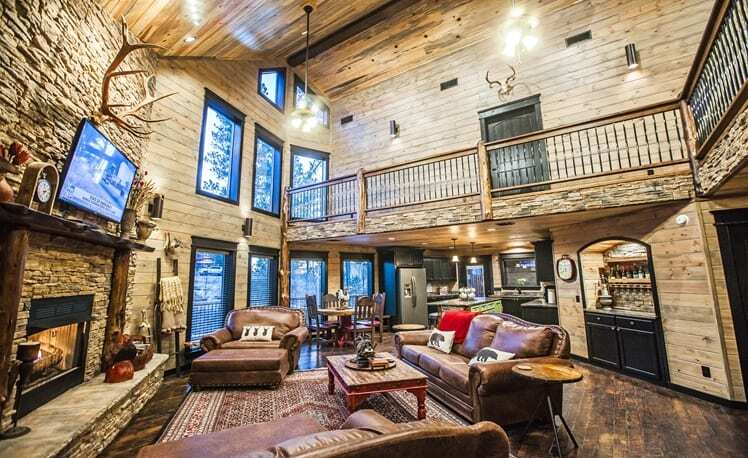 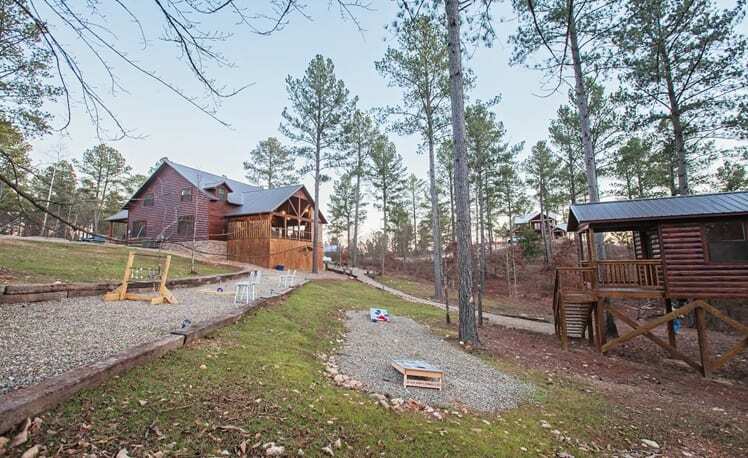 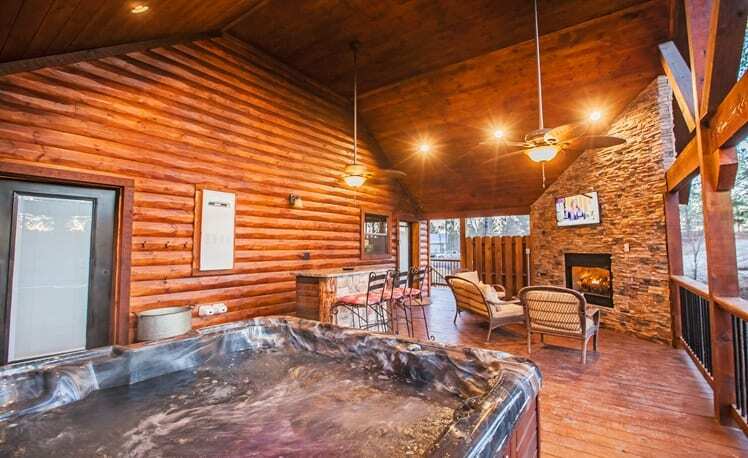 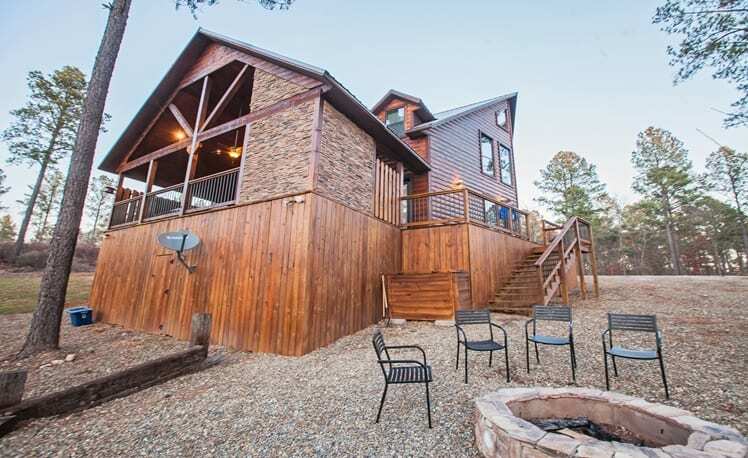 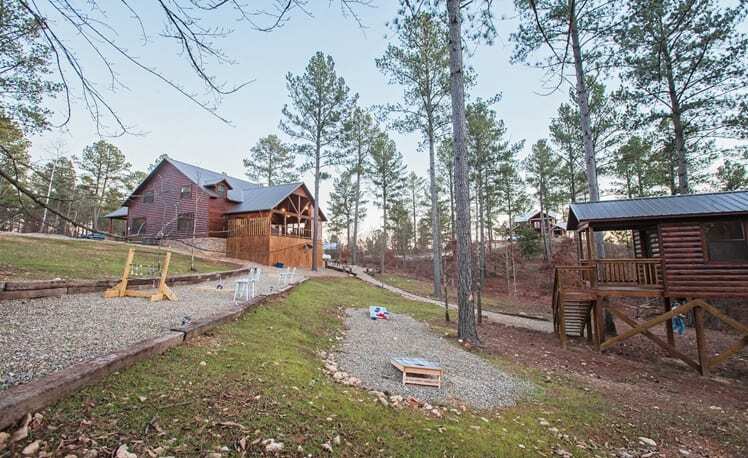 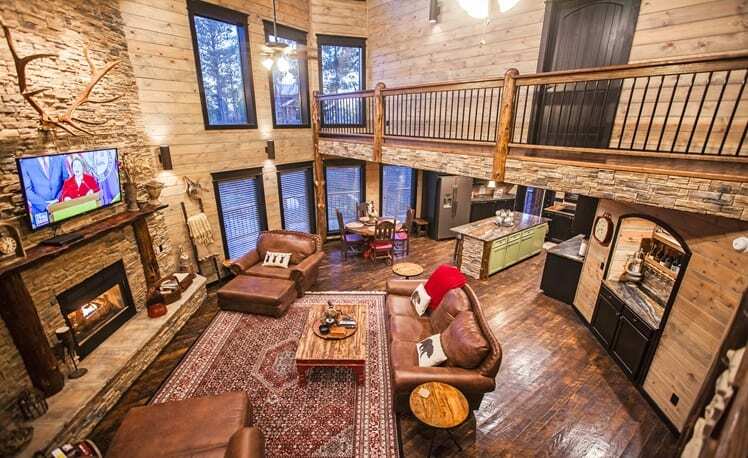 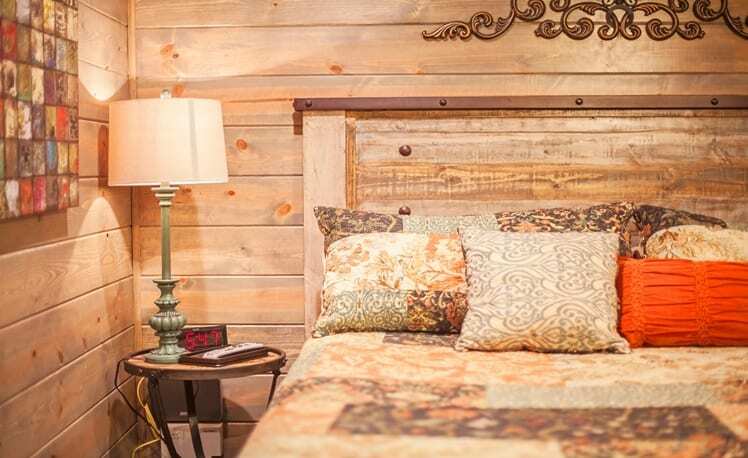 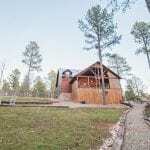 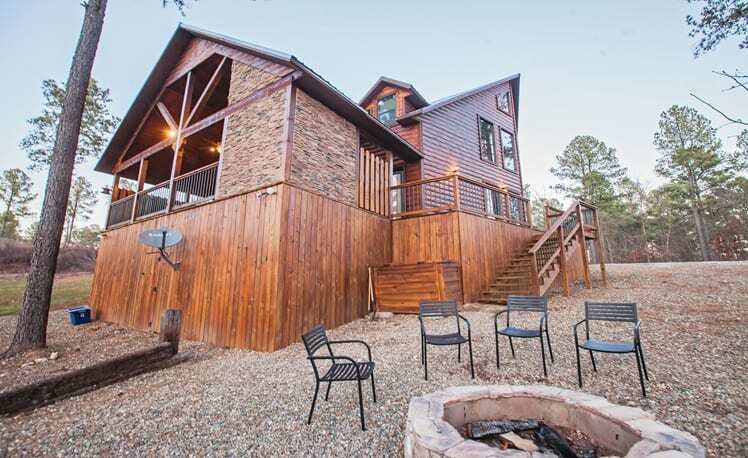 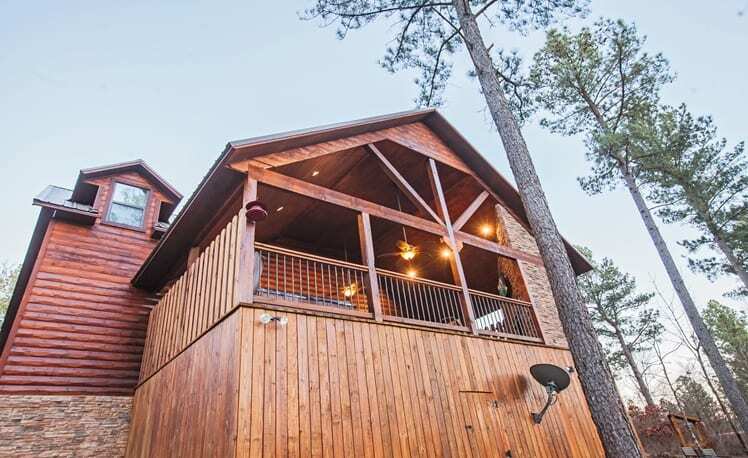 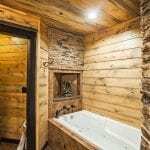 Group Cabins: Heavenly Bear Lodge is both located within walking distance to Mountain Melody. 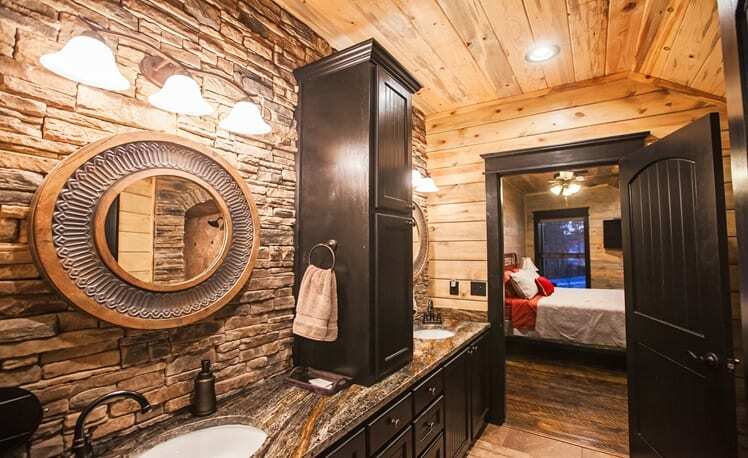 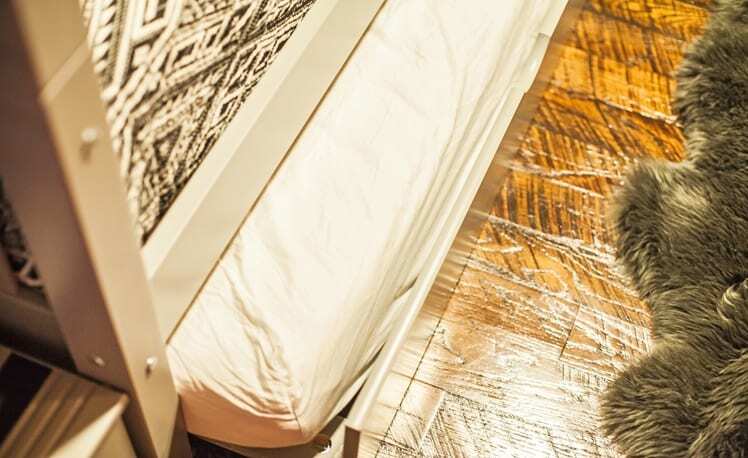 * A $100 cleaning fee is charged per reservation. 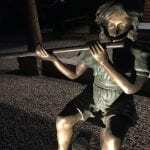 Do you have questions about the Mountain Melody?